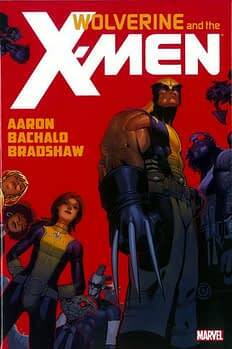 With books such as Marvel’s Wolverine And The X-Men HC collecting four issues of 20 page comics (rather than the seven issues on the Amazon’s listing), shipping yesterday for a whopping $19.99, some readers are in revolt. Not so much the $3.99 twenty page comic, but four $4.99 twenty page comic in a stiff binder. That’s 25c a page. Damn. Added to the fact that customers can buy the books close to what retailers pay for them in advance, from Amazon, there’s a fair amount of ruction. Take the Avengers VS. X-Men hardcover, collecting the series and its spinoff, over 500 pages, knocked back from $75 to $39. Or the Uncanny X-Force: Otherworld hardcover, which would be five comics for $24.99, now a more reasonable $13. Same with Moon Knight Vol 2, Ultimate Spider-Man Vol 2, and Wolverine Goodbye Chinatown. It’s a similar (though better value) story for upcoming paperbacks such as Deadpool – Volume 9: Institutionalized, Daken: Dark Wolverine: The Pride Comes Before the Fall and Daredevil, Vol. 1. Batman #9 And Walking Dead #97 To Sell Out Fast. Very Fast.